St. Louis Circuit Judge Rex Burlison on Thursday denied a motion to dismiss the felony invasion of privacy case against Gov. Eric Greitens. Although he struck down the defense’s request for dismissal, Burlison did grant the defense permission to re-depose William Tisaby, a former FBI agent hired by St. Louis Circuit Attorney’s office to help with the investigation, as well as K.S., the woman at the center of the case, and her ex-husband, known only as P.S. Burlison said the deposition is limited to the notes and video evidence that had just been recently turned over by the prosecutors. Gov. 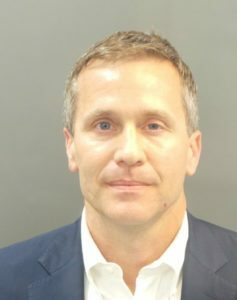 Eric Greitens was taken into custody Thursday, February 22 in St. Louis City after a Grand Jury indictment. Booking photo from the St. Louis Justice Center. Scott Rosenblum, one of Greitens’ defense attorneys, requested that dates and times for the depositions be set immediately Thursday. The prosecution requested that the depositions have a limit, citing that K.S. had already been put through eight hours of questioning. Burlison said he would not rule on when or how long the depositions would take place but added that if both parties could not agree on a date, he would set one. Furthermore, Burlison ordered that the defense must cover the costs of all three depositions. Burlison also said he could bring further sanctions and reevaluate the motion to dismiss if it is proven the prosecution withholds evidence again. “If further conduct is brought to light, the court will look again at defendant’s sanctions of dismissal,” Burlison said during the hearing. In addition to the videotape being presented to the defense, Martin argued that Tisaby lied under oath when he said he did not take notes during the interview with the former mistress of Greitens in a March 19 deposition at Carnahan Courthouse. 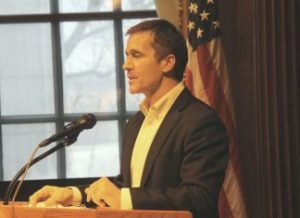 Last week, a report was released by the House Special Investigate Committee on Oversight, detailed the alleged conduct by Greitens with a woman who testified under oath that Greitens subjected her to non-consensual sexual activity and violence.